A Greek doctor snapped this amazing image during a Caesarean Section. 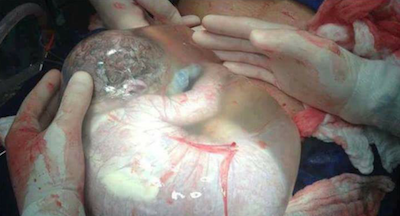 During the operation, the most unusual thing happened – the Amniotic Sac remained intact as the birth progressed. Typically it breaks, but this time it did not – leading to the baby not even being aware it had been born. The good news is, this baby was born safe and healthy! SHARE this amazing photo of the creation of life with your friends! What This Checkers Worker Did To This Burger Before Serving It To A Customer Will Make You Sick!